The shameful interventions by shadowy but influential think tank the Institute of Economic Affairs in Brexit, embroiled in all sorts of scandals, including vague funding from shady American donors – talks about the Brexit Prize, which says it all: “There is a substantial Brexit prize available to the UK if it is able to improve its own regulatory system, sign trade deals with other countries, and help work towards greater global liberalisation in areas that matter most.” Replace the ‘UK’ for USA – and the text is exactly right. The trouble is, not one single trade deal is close to being signed and even the WTO has just rejected Britain’s application. America wants free access, not access with any type of regulation – and so it was the biggest objector to Britain joining the WTO. The truth about Brexit is that it was fought out in the shadows with right-wing American think tanks funded by transnational corporations and individual billionaires using illegal data, illegal funding sources and illegal strategies. The evidence of this keeps piling up. But once the American’s have a foot in the door, Britain will spiral into terminal decline. American political attack operations have already opened their doors to further poison political discourse in Britain and a once tolerant unified nation of stiff upper lips with an attitude of keeping calm and carrying on will descend further into division, dissent and intolerance. The Electoral Reform Society and Open Democracy have just reported on what we can expect if Britain does not defend itself from the final American goal of turning the UK into a serf island state on the edge of Europe. 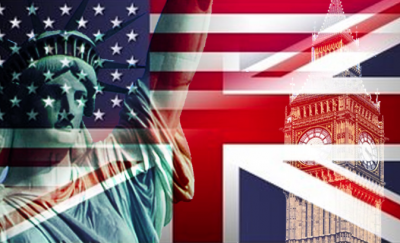 By Kyle Taylor: If you are interested in a preview of what British politics could look like in 20 years without urgent reform, look no further than the United States. This is an edited extract from the Electoral Reform Society’s new report: “Reining in the Political ‘Wild West’: Campaign Rules for the 21st Century” published by OpenDemocracy.